As I’m sure most folks are familiar with, when roads are made in the mountains they often have manmade cliffs over them. These little cliffs almost always have delightful little falls or showers where streams that once flowed now fall. This fern was in on of these showers. My umbrella was being blasted with water from the showers the whole time I was setting up and shooting. I have to thank my roommate for holding it and keeping me dry. Went back and experimented with a photograph. Building ideas for how this could be put to better use in the near future! The photo is from the lake across the street a few days ago. I want to work with these a LOT more. Very very easy, and very fun to make. From the start of post to the exporting of the .gif this took maybe 15-20 minutes. And on that note, onto the pictures. One of the few last spots of bright color. The stem was naturally that purple as well. 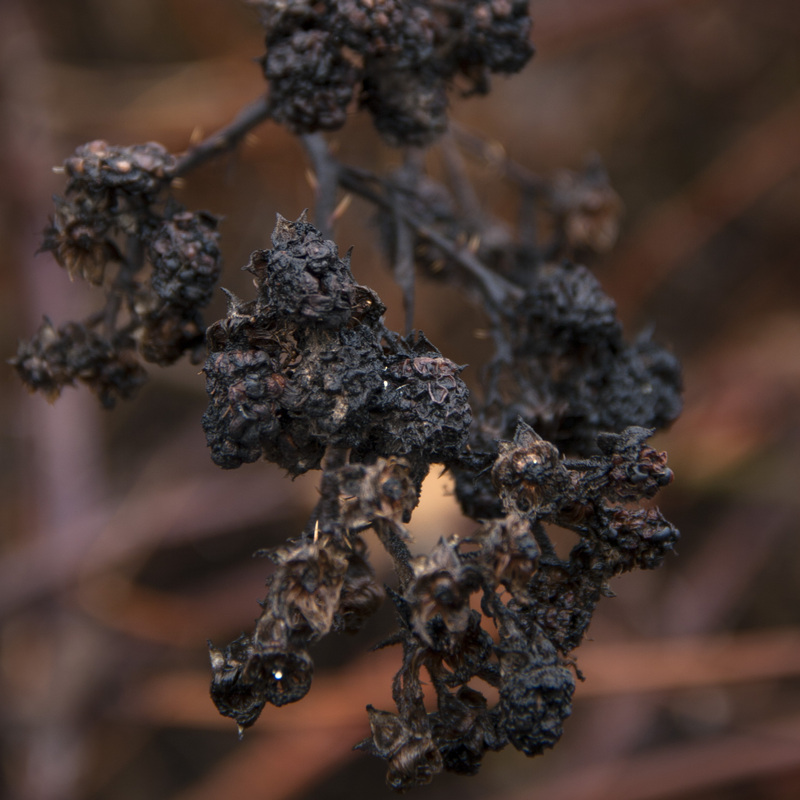 Though they don’t look appetizing, the dead black berries make complex, burned, and alien terrain if you look close enough. For the past few weeks every time that I’ve gone out with my camera, I’ve ended up taking photos of dead plants. This is a selection of those photos. And, because it’s always threatening to rain or actually raining, all of the light is nice an consistent across the whole batch. While pretty when they’re alive, their shapes become very interesting as they dry up. This is one of my favorites, when I was doing post on this one, I noticed you cans see a small blue lady beetle about mid picture. Even the lake plants across the street from where I live change hugely in the winter. I think that one of the reasons that I find all these dead plants so interesting is because for the most part everything stays green here. Most of the trees are fir trees, and ferns, ivies, and a lost of other small bushes just stay green though winter. Also the wet weather breaks most of the dead plants down fairly quickly, so by this time of year you actually have to keep an eye out to notice them. If i were to ever describe a plant as pissed, it would be this one. To take this I was standing on a nubbin of old foundation that was peeking out of the water on the lake. In the overgrown field near an abandoned farm.